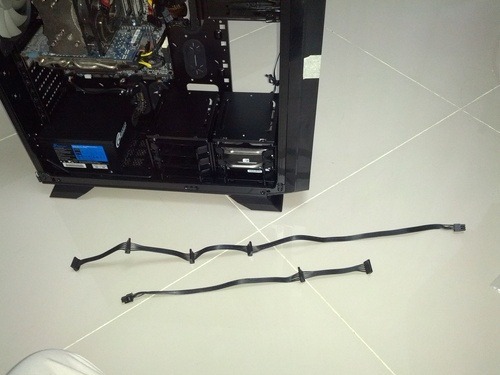 An important and sometimes overlooked step to building your own PC is cable management. It may seem trivial, but good cable management can keep your computer running cooler and faster, and lengthen the time between cleanings. 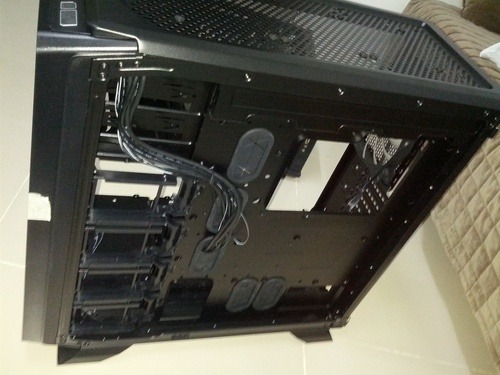 All the cables inside your case – especially ones with webbing – are major dust magnets. 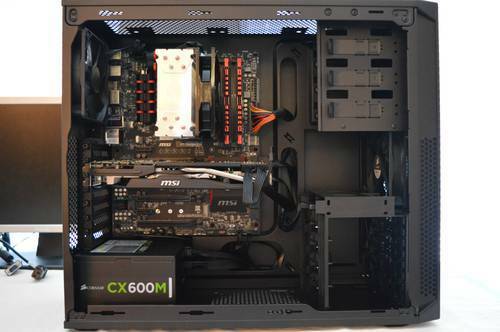 Any chassis, from the $30 entry-level boxes to the fortress disguised as the Corsair 900D, can give you cable management options. With good cable management, you get better airflow (keeping your components cooler), and minimize dust buildup (also keeping your components cooler). 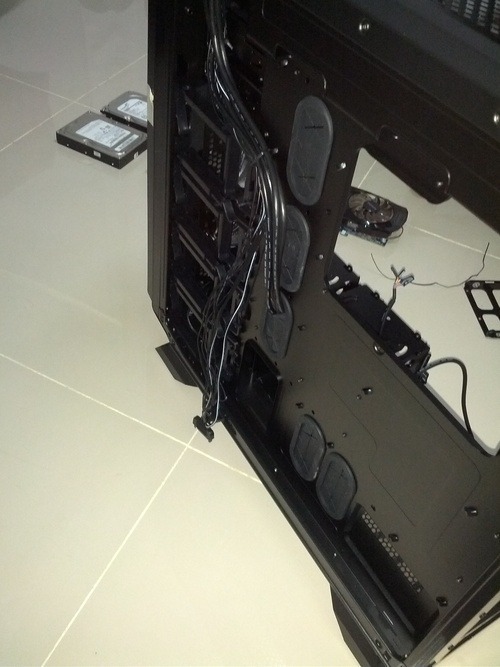 Clean cable management by Reddit user OriginSuperKingXero. 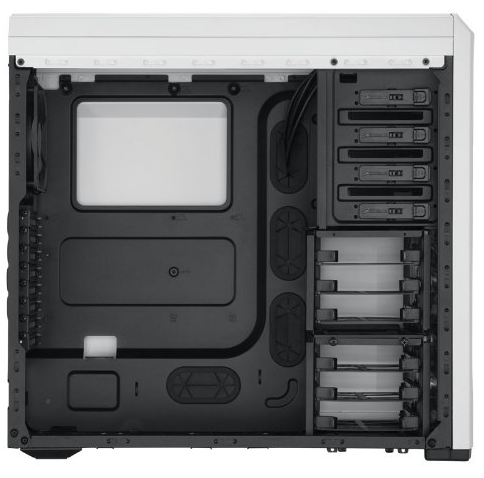 Look for a case with cable management options. This means having space behind the motherboard tray, and motherboard tray cutouts/routing holes. 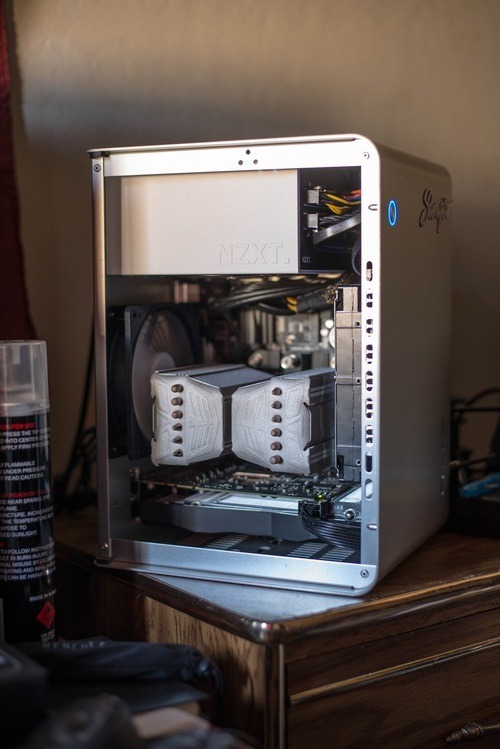 Fortunately, even low-end cases have those features these days, but you should still double check to make sure that the case you are buying is good for cable management. 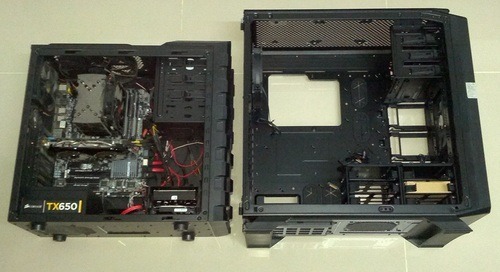 The Corsair 500R is an example of a case with good routing holes. A modular power supply unit allows you to add or remove cables as necessary, making cable management easier by removing unused cables. This means fewer cables to hide, and more room to arrange cables properly. While great cable management can certainly occur with wired PSUs (see below), you will notice that the cleanest and neatest PC guts will almost always utilize modular power supplies. Two modular PSUs (top) and one wired. We leave it up to you to decide which is preferable. Assembling a PC is easy. Good cable management is not. You will be arranging the cables, discovering a better arrangement mid-way through, undoing your previous work, redoing the wiring, and then discovering an even better way just as you’re about to finish. If you’re careful, you’ll do a good job on your first try, and get it perfect on your seventh try. You’ll have an easier time with future installations, but your first attempt at good cable management will need a bit of patience. 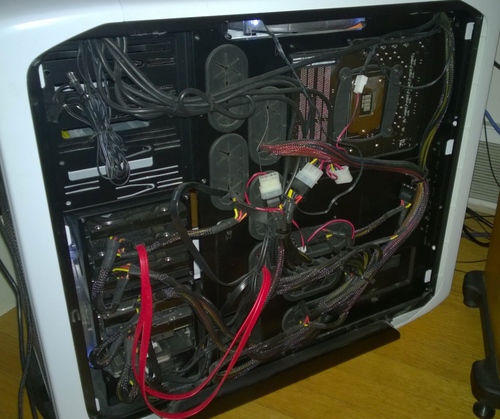 Good cable management is still possible even with a wired PSU, as demonstrated by Reddit user TheRealRacker. So, how do you go about managing your cables? The first step is to plan your device installation. There aren’t a lot of options when it comes to expansion cards, but optical and hard drives have multiple mounting spots. A bit of planning here can save you a mess of cables later on. Since these drives don’t require a large amount of power, you can run several of them off of one SATA power cable out of your power supply, as long as they are mounted close enough together. By using one cable for several drives, as opposed to one cable per drive, your reduce the total number of cables, and make cable management easier. 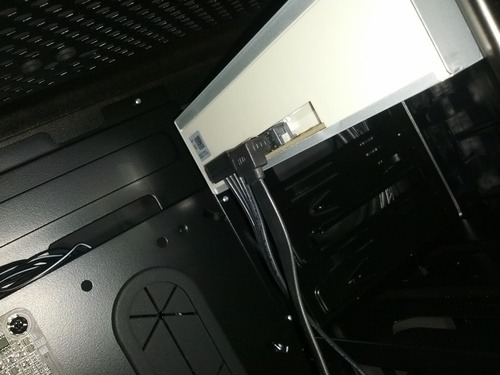 In our personal experience, mounting the disks close together allows you to store excess cables in the extra drive bay space underneath them, which keeps the cables out of the way of any fans or windows that might be present. Kalashnikov manages to keep everything tidy in his ultra tiny case. The second step is planning your cable routes. Pinches and sharp bends in power and data cables should be avoided as they can cause the internal copper wires to be damaged. It is acceptable to run both power and data cables parallel with each other, as there is no risk of interference. Most cases will have holes punched in the motherboard tray to allow cables to be routed through them and out of sight. Next, care must be taken when rubber grommets aren’t present; too much friction or pressure against the sharp edges can cut into the insulation on the cables, which is bad news. 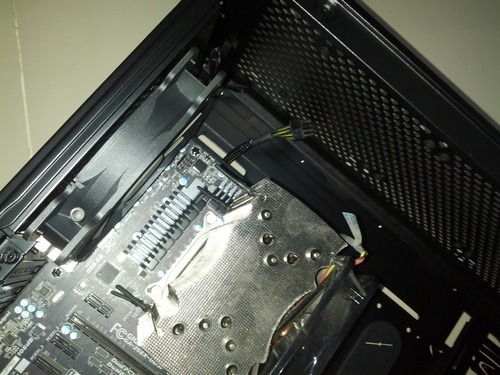 Typically, the main ATX power connector, SATA connectors, and front panel connections are all on the right side of the motherboard which makes it easy to route them through the holes, leaving very little of the actual cable exposed. From here, they can be guided along the rear side of the drive bays and out of the way of any fans mounted in front of the case. 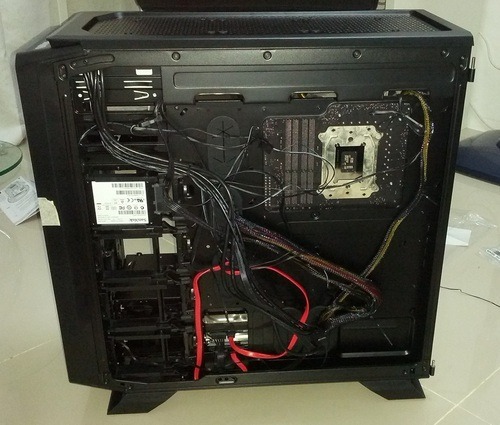 Lyk’s case is a great example of cable management. 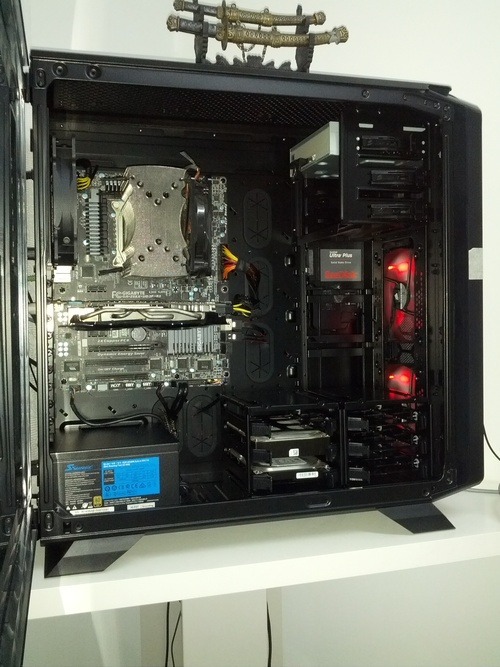 Even with a wired PSU and two graphics cards, he does a stellar job. Finally, the cables can be secured with zip ties. There are usually several holes and drive cage support brackets that can be used to secure your cables. 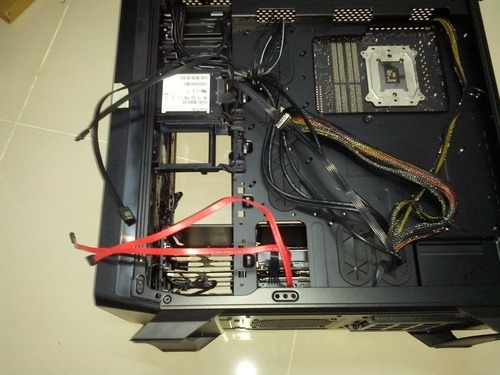 Cable bundles should be kept small enough to avoid being pinched or smashed when the right side case panel is reinstalled, and any molex connectors should be as flat against the motherboard tray as possible. Avoid tightening the zip ties too much; you don’t want too much pressure on the cables, and it can be difficult to cut them off without damaging a wire if you are performing upgrades. 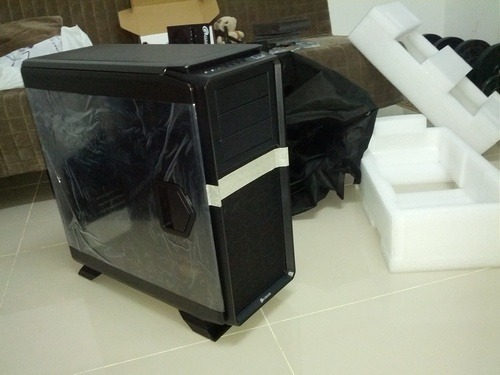 To demonstrate the above steps, Falcon (one of Logical Increment’s staff) bought a new case, and a new modular PSU. 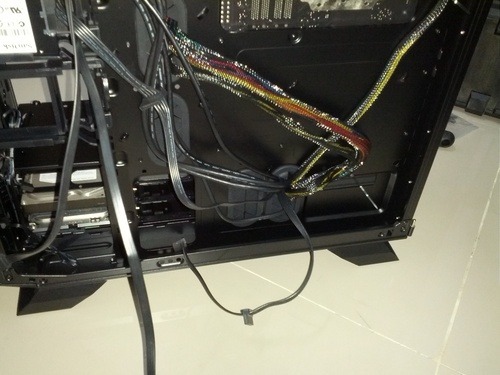 He transferred his old build from a HAF912 (good mid-tier case), did his best to manage the cables properly, and took pictures while doing so. Check out the following transplantation documentation, but please note that different cases and different power supplies will mean that you cannot follow these steps 100%. 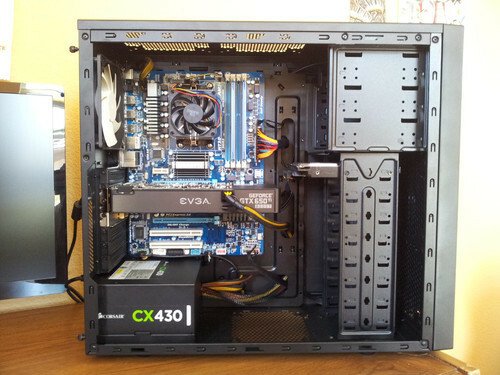 This is Falcon’s old PC, powered by a wired PSU and housed in a HAF912. 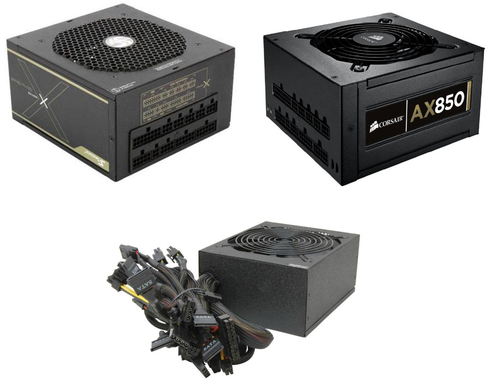 Decent PSU and case, but not high-end. 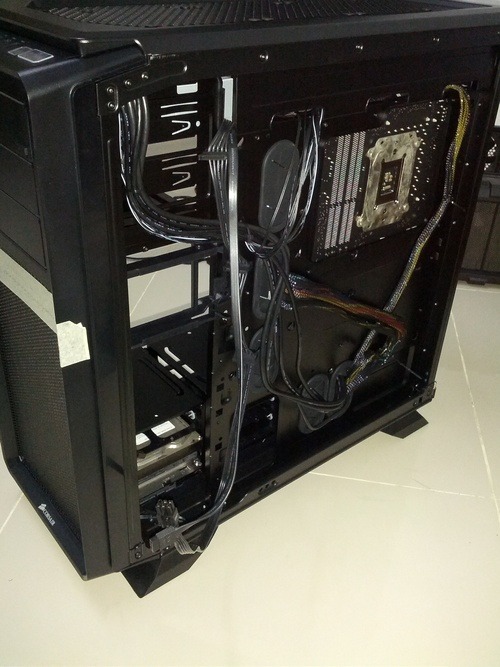 The cabling is ok-ish, but not good enough to showcase. 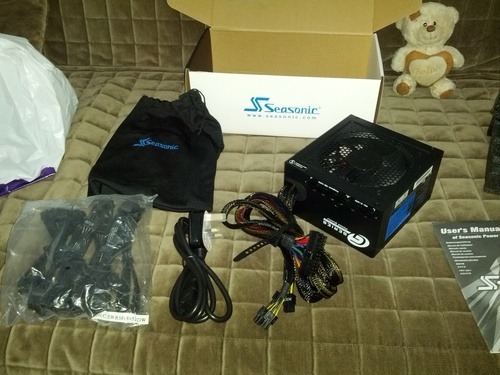 A Seasonic SSR-650RM to replace the TX-V2 650W. Note the extra cables in the plastic bag. 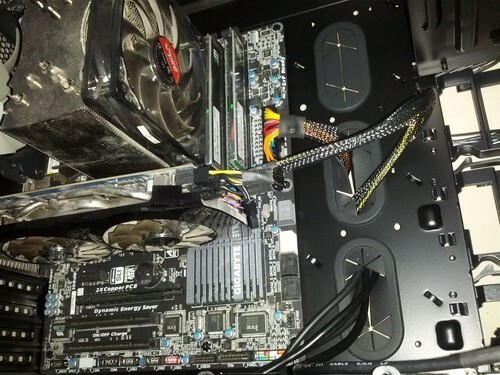 Notice that the new PSU is semi-modular, with only three wired cables: The 24-pin motherboard power connect, 8-pin CPU power connector, and one PCIe power connector. A fresh 760T. It was mostly chosen for the easy-to-access dust filters. For reference, this is what the back of the motherboard tray looks like at the start. At the end of this blog, you will see how messy the back can get. Side by side comparison of the two cases. 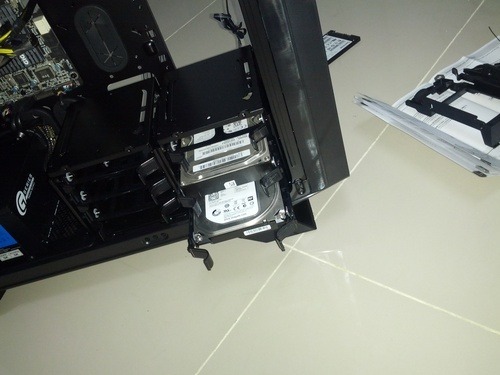 DVD-drive, two HDDS, one SSD, and a graphics card have been removed from the old case. You can see the wiring of the old PSU. Compare this with the wiring of the semi-modular PSU, shown just a couple of pictures below. The first step in cable management. Falcon separates the fan power cables from the case’s front panel connectors. The new power supply is put into place. 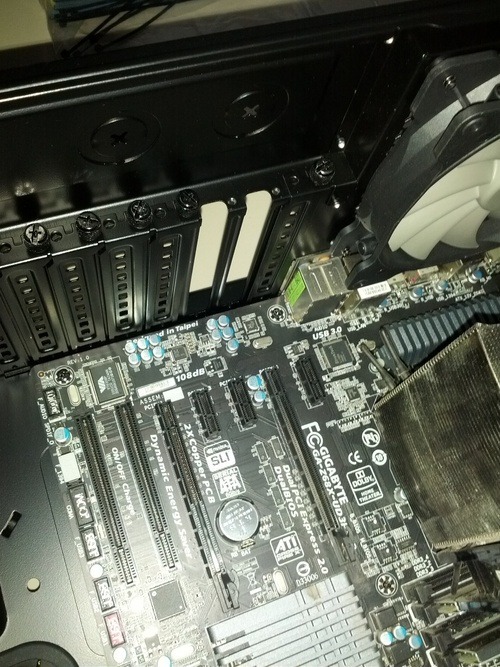 Notice how the power supply’s cables are routed behind the motherboard tray? The rubber grommet helps keep the wires in place (a little), and also help keep with the “clean” and tidy look. This is what it looks like from behind. The next step is to add the 8-pin CPU power connector. 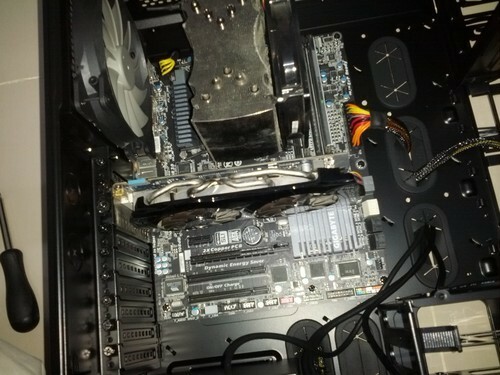 Here, you can see the 8-pin CPU connector, and the hole in the motherboard tray that it goes into. And out from the other side. The 8-pin CPU power cable is in. On to the 24-pin motherboard cable. The 24-pin cable will be inserted through the middle hole, as that is the closest opening to where it goes on the motherboard. 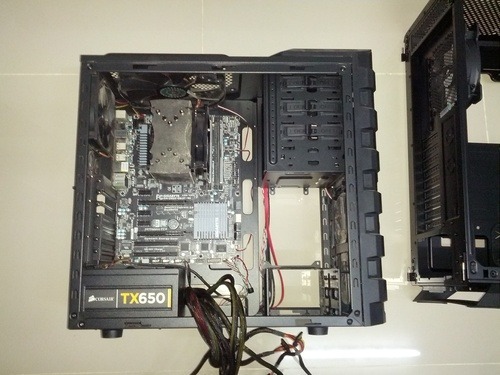 Please do not mind the messy front-panel connectors, they will be taken care of, in time. The 24-pin motherboard cable can be seen here, ready to be attached properly to the motherboard. The 24-pin cable is attached. 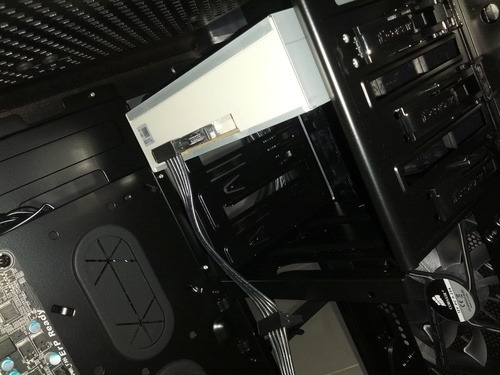 Before we attach the final wired cable from the PSU (the PCIe power cable), we need to put the graphics card in. 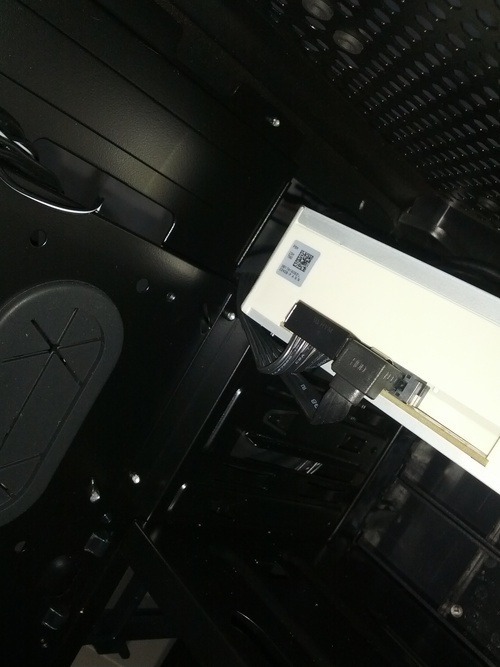 Two expansion slot covers are removed. 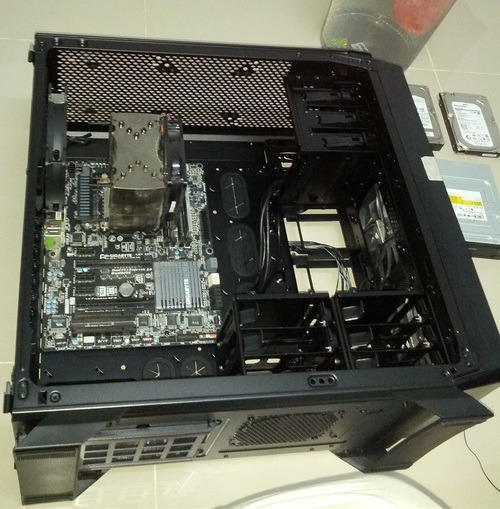 The graphics card is inserted and secured. 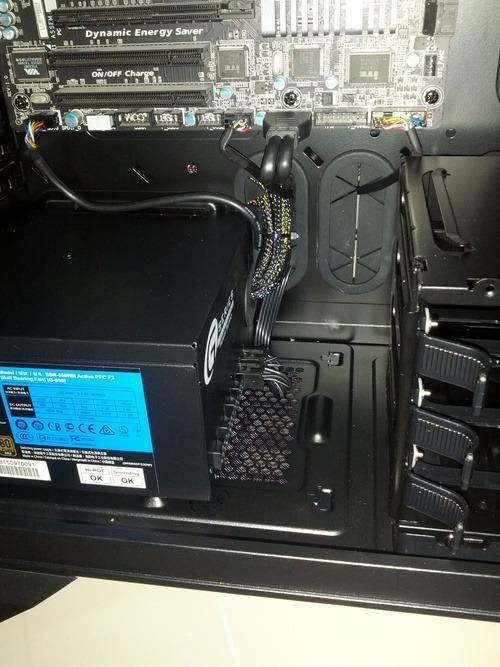 The PCIe power cable is attached. It is now time to take care of the front panel connectors. 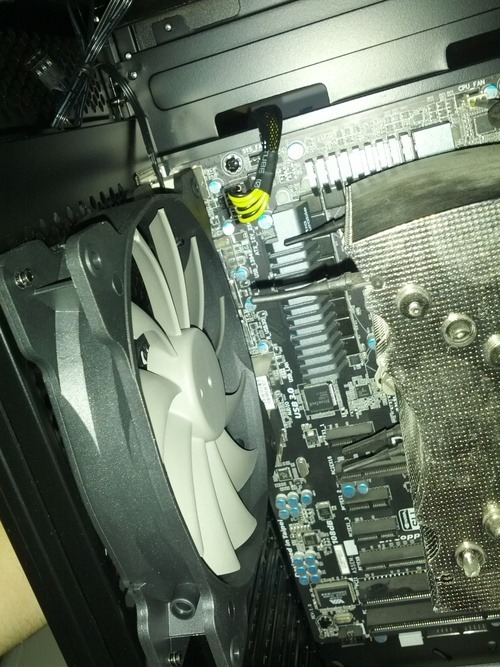 Notice that by default, the come out from the hole to the right of the motherboard? This is not optimal positioning. The front panel connectors are taken out from the default opening, and routed to the two bottom openings. With the cables coming in from the bottom, they are a bit easier to manage. Note that Falcon does not use any of the front audio or USB slots, so these cables are there purely as an example for you, dear reader. 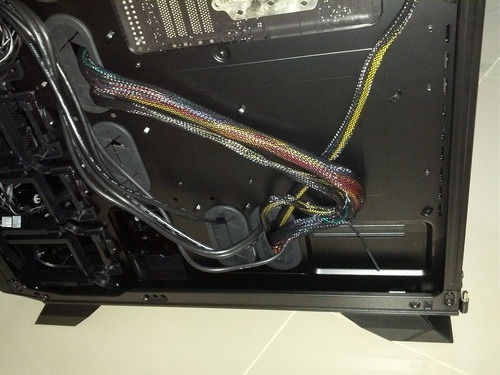 Later, the unused cables will be removed. 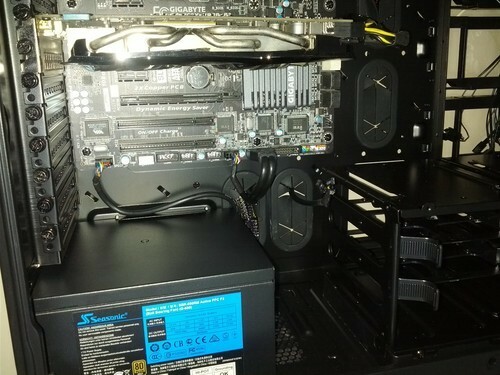 At the point, the motherboard, CPU, and graphics power cables are in, as well as the front panel connectors. Only the storage remains. The DVD drive is added. No cables yet, as the HDDs and SSD need to be added too, so that the cable management for all 4 items can be done together. Each HDD goes into its little tray. And the trays slide nicely into the case. 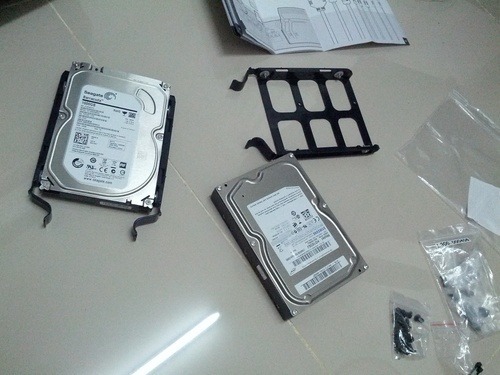 Note: Even though Falcon had carefully planned every step, putting the HDDs into the rightmost bay was still a mistake. You will see why in a moment. 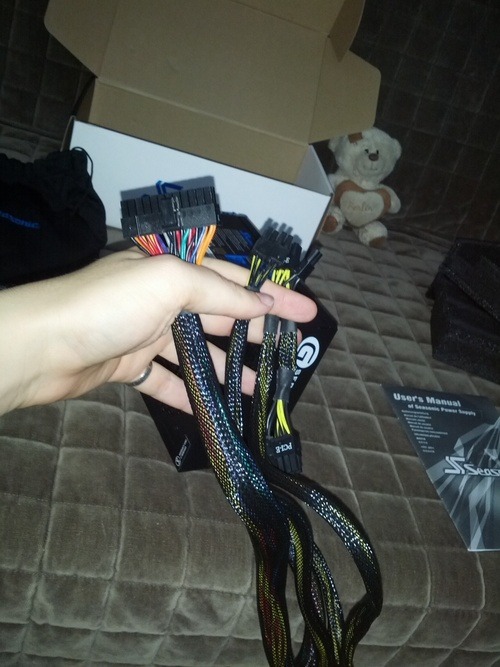 SATA power cables, to power all the storage devices. The long one will power the DVD-drive and the SSD, and the short one for the two HDDs. 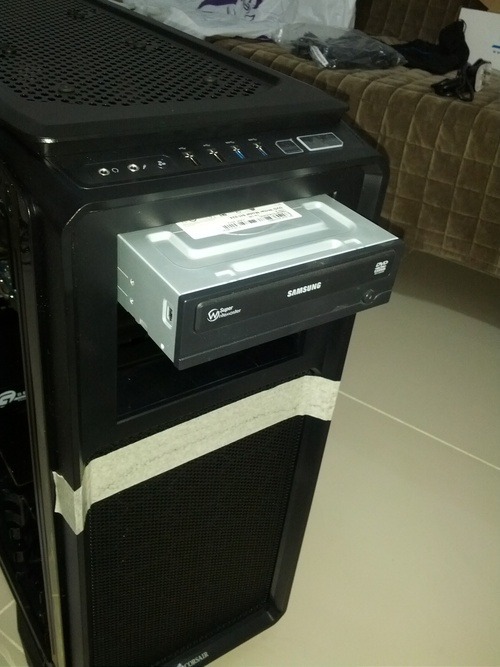 Falcon did not add the SDD until after putting in the DVD-power cable, so to judge the best location for the SSD. SATA power for the DVD drive. And a SATA data cable. 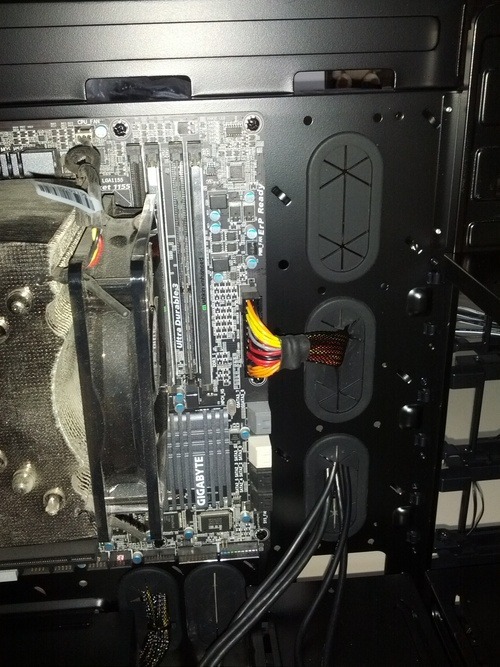 Both cables are routed behind the motherboard tray. The hole they were routed into is difficult to see in this picture, so check the picture below. It is much easier to see where the two cables come out from. With the SATA power cable now out, Falcon can judge where best to place the SSD. The SSD gets its own small tray. 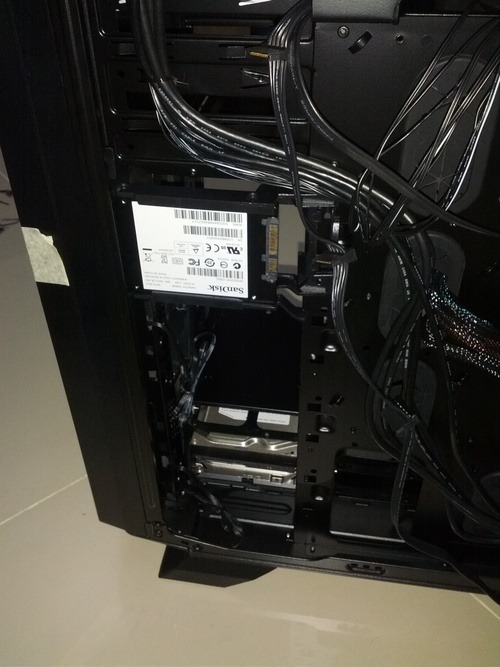 The SSD is secured into place. 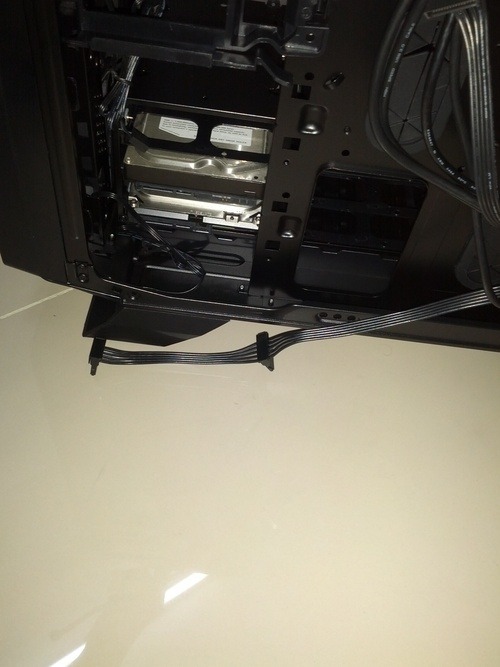 Please note that this case allows you to place the SSD in this “hidden” spot, for best cable management. If 1TB-2TB SSDs were cheap, you could skip having an HDD and remove the HDD drives cages altogether, for maximum airflow. SATA power is plugged into the SSD. 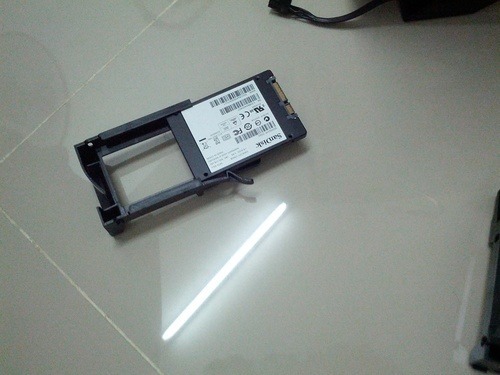 The SATA power cable from the DVD and SSD is inserted into the bottom hole. 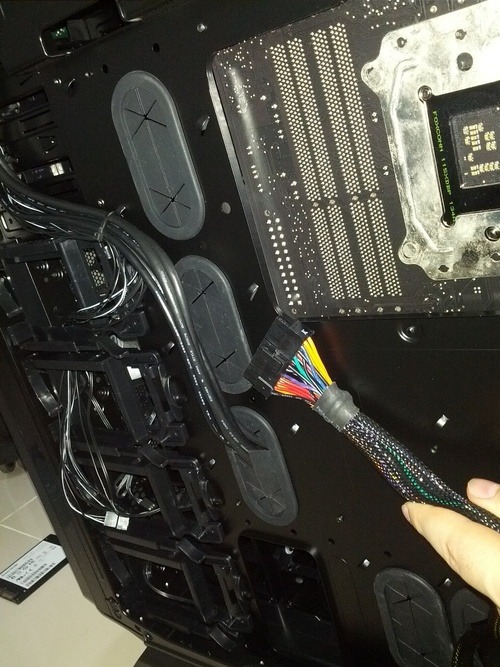 A second SATA power cable (seen just dangling there) is also inserted. 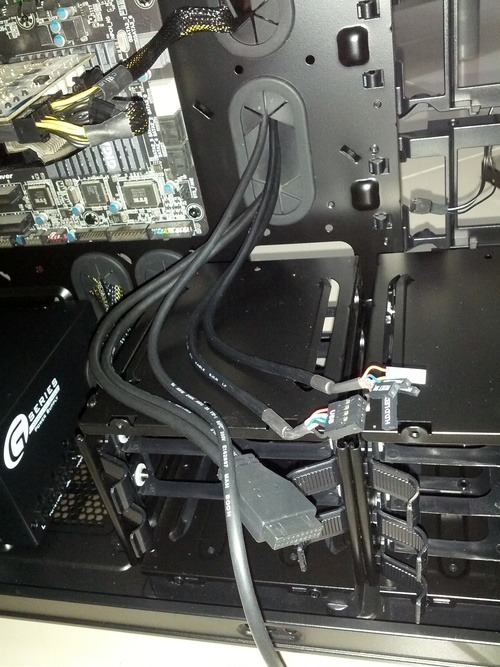 This second SATA power cable is meant to power the two HDDs. 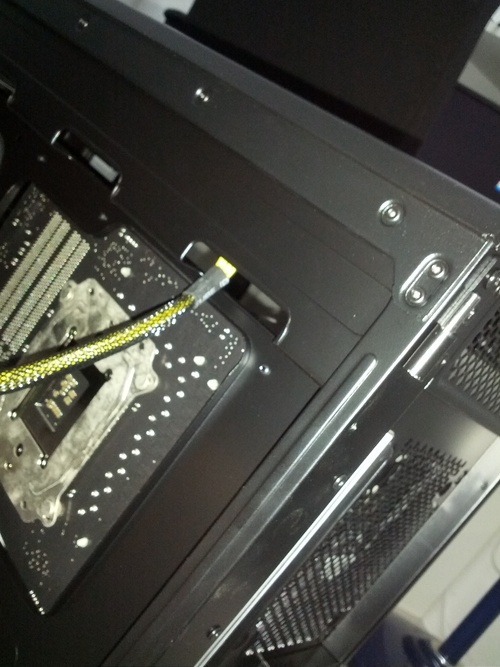 From the other side, the two SATA power cables can be seen. 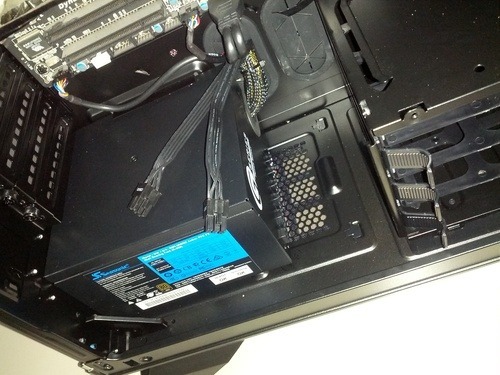 The two SATA power cables are plugged in to the power supply. However, they do not look neat. We can fix this. Now to plug in the SATA power cable for the HDD, but there is a problem. Remember how it was mentioned earlier that using the rightmost (in this image taken from behind, leftmost) HDD drive cage was a mistake? 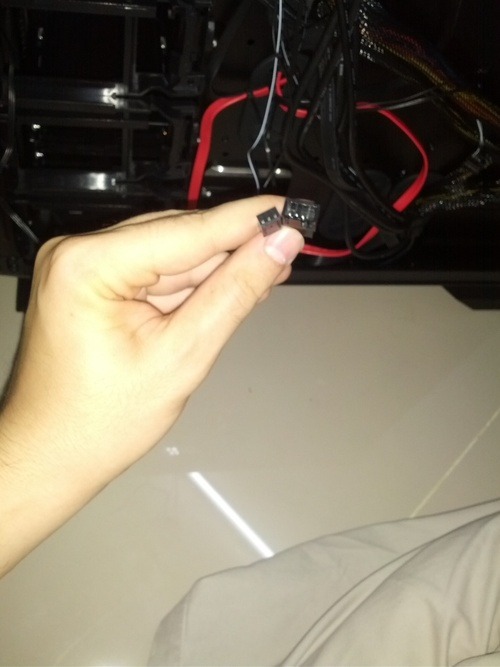 That is because the SATA power cable is about 1 inch too short. But it is not a problem. 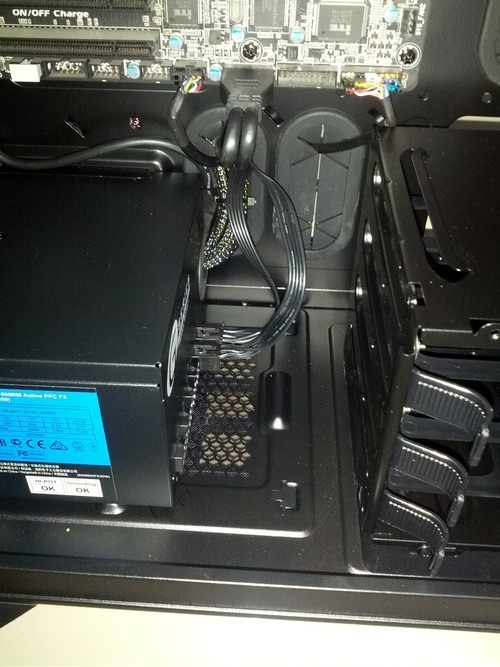 The HDDs are moved to the nearer HDD drive cage, and the SATA power cable is plugged into both. 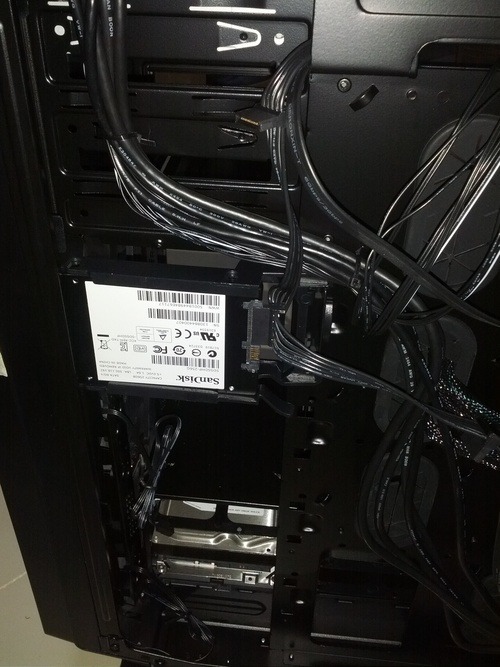 At this point, all power cable for all storage devices (HDDs, SSD, and DVD drive) are in. 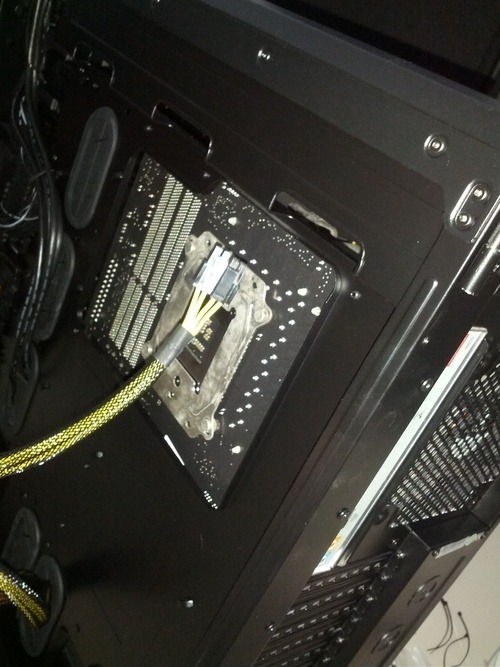 What is left is to add the SATA data cables. 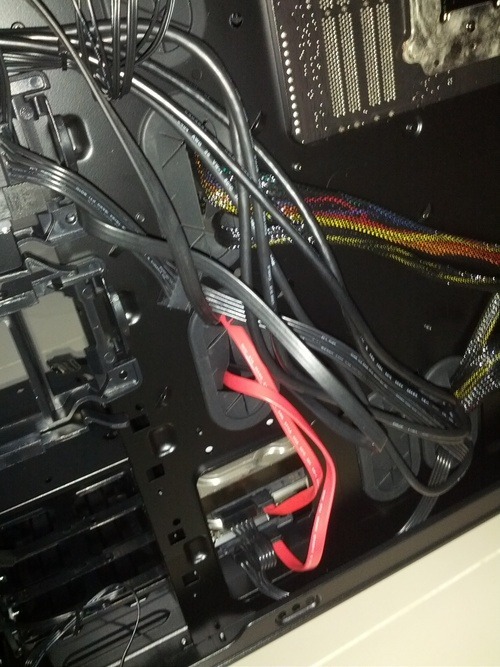 Here you can see the two black SATA data cables from the DVD drive and SSD, and two red SATA cables from the two HDDS. All SATA data cables are inserted into this hole. And out of the other side, and into the motherboard. Falcon tried to hide the red cables behind the black ones, but he was not very successful. 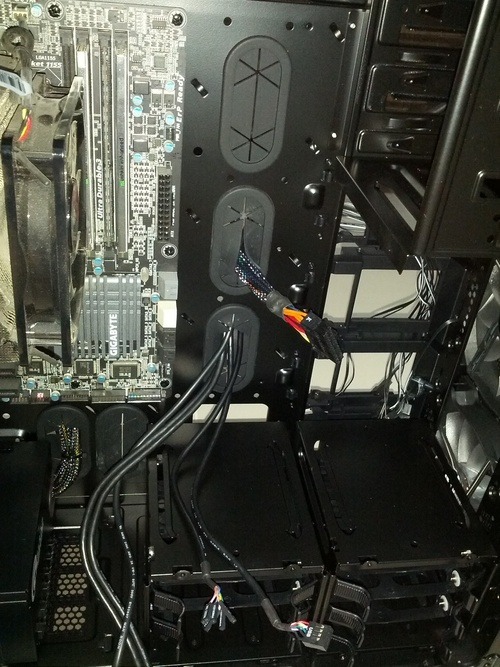 At the point, all power cables, data cables, and front panel connectors are in. The only thing left is to connect the case fans. 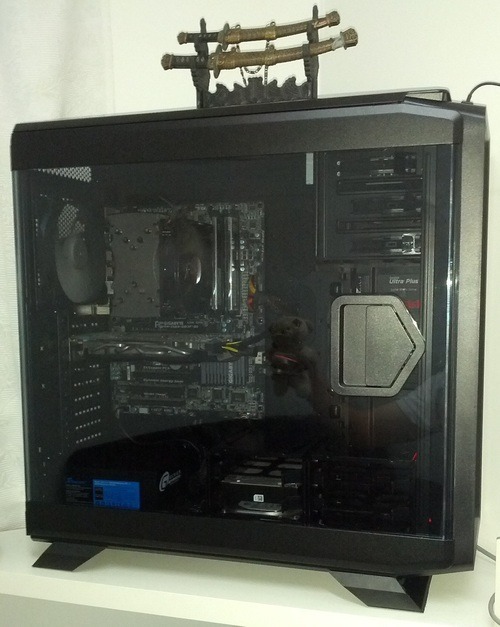 If you haven’t got a case fan yet, check out the best 120mm case fan. 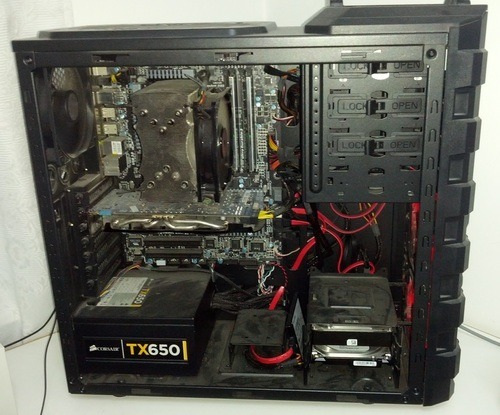 Many cases have the case fans connected to the motherboard, but the 760T is a little different. 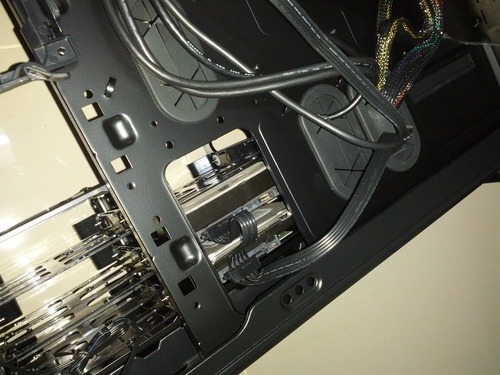 This case has separate fan power cables (shown in the picture above) that you can connect behind the motherboard tray, which helps a bit if you want to keep the front very neat and tidy. Connecting these is the final step. The computer is now ready to be 100% functional. This is what the back of the motherboard tray looks like, with zip ties used to secure the wires in place. Not so bad, but it could be neater. The front is neat though. With the side panel on, the new case looks pretty good. Teddy bear says hello. 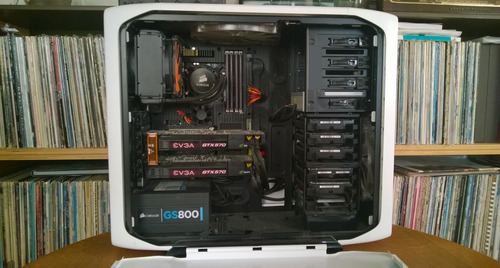 When Falcon removes a few unused cables, the interior of the case becomes quite clean. 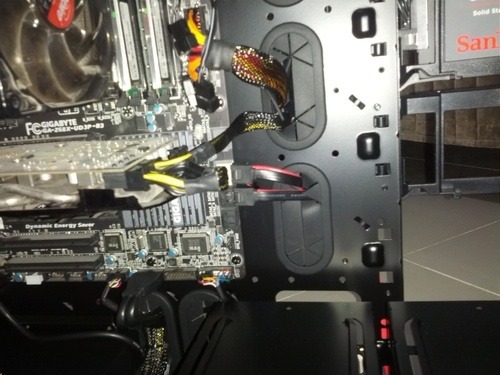 The 24-pin and PCIe cable are the most prominently visible cables, since the exposed yellow and red wires are in contrast with the the rest of the interior, which is mostly grey and black. This ends the step-by-step demonstration. We remind you that your case and power supply may be different, so you may not be able to follow these steps 100%. 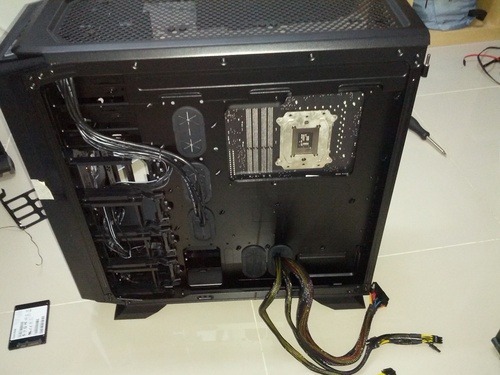 However, you will have a good idea of where each cable is meant to go, even if the holes in your case are positioned differently from the one used in the example above. 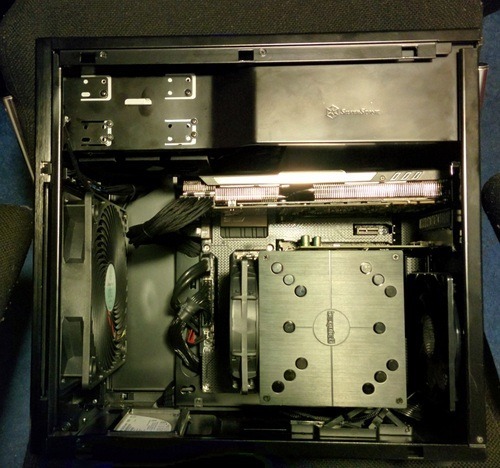 We hope this blog post helps you get a tidier case, with better airflow and less dust. 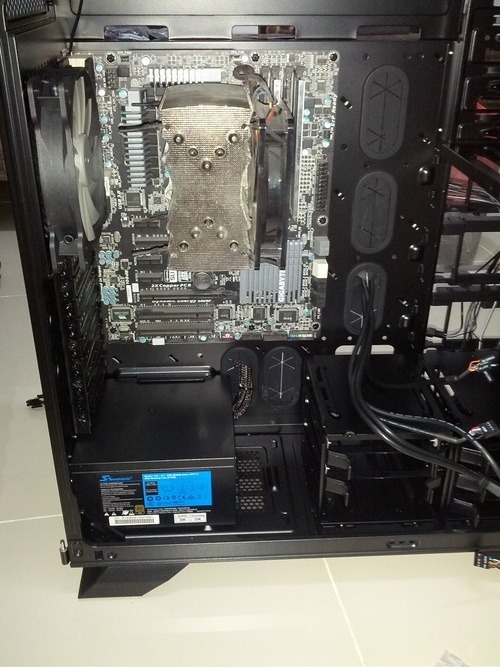 Legendary’s PC’s guts stay neat, even with a relatively small case. 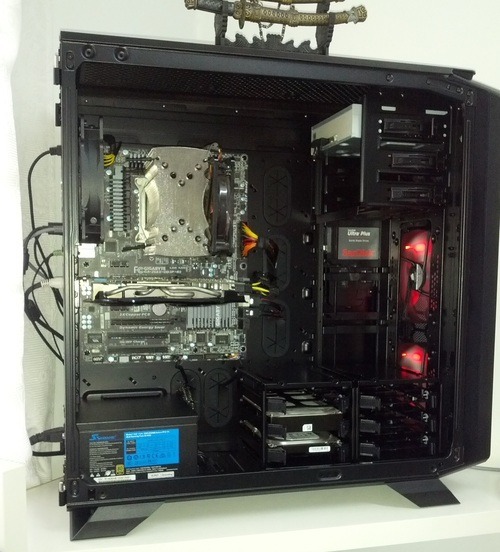 Logical Increments is looking for bloggers who enjoy writing about PC hardware and gaming. More information here.